Greet your guests with the exceptional style of our Amish Brookstone Hall Tree Bench. This storage bench is made to order in an Indiana woodshop that we are proud to work with. Its expert Amish woodworkers make sure that no corner is cut in the construction of your hall tree coat rack. 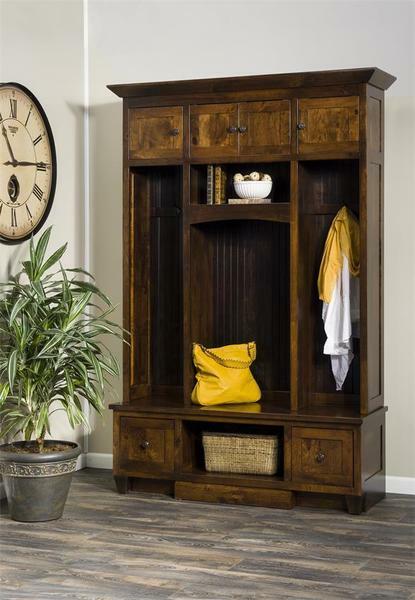 The result is an heirloom quality solution for your foyer storage needs. The Brookstone is complete with 5 options for hidden storage, as well as 5 open cubbies that easily accommodate long items of clothing such as coats and scarves. You will be able to incorporate some decorative flair by placing a few books, baskets, or bags as we have pictured here. We love the pops of yellow that serve to bring out the beautiful coffee stain that the bench is finished off with. We offer 8 varieties of solid hardwood as well as 6 rustic versions to choose from. Each of these is handpicked and sourced from right here in the United States. From the Amish craftsmanship that this hall bench is made with right down to the material it is constructed in, your new entry bench is American made through and through. Why not make the best first impression? The quality of our Amish furniture speaks for itself. Family and guests alike will love arriving in your home when they are met with fine craftsmanship. By choosing well, you will buy less often because this is a hall tree made for a lifetime. Please do not hesitate to get in touch with our team of friendly Amish furniture specialists by calling 866-272-6773. They look forward to guiding you through the process of creating your dream furniture! Visit our Sarasota, FL retail store to get up close and personal with our American made Amish furniture.